The ONCA are looking for contributions for Remembrance Day for Lost Species 2017. Human created pollution, climate change and deforestation is causing unprecedented species loss. 40% of the wildlife on earth has disappeared in the last 40 years. Remembrance Day for Lost Species is a chance each year to learn and tell the stories of species driven extinct by human activities, and commit anew to what remains. 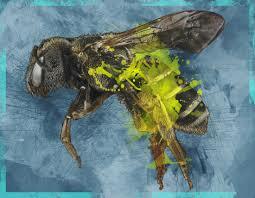 The theme of this years remembrance is extinction- and pollinators, a topic close to all of our hearts. Contributions will be shared on the ONCA website, and potentially in the gallery and they welcome all mediums including visual art, performance, creative writing, historical accounts and artefacts. They are also calling for artists, companies, schools and communities to hold memorial events on and around November 30th 2017. These could take the form of processions, “funerals” or participatory events marking the extinction of pollinator species and/or the ongoing threats which human activity poses to surviving pollinators.